A cooking challenge organized by Meg of Grow and Resist and Briggs of Oh Briggsy in which we explore a featured cookbook each month. The selection for March is Becky Selengut’s Good Fish, Sustainable Seafood Recipes from the Pacific Coast. This is my third post on the topic. The first one is here and the second one here. With Easter approaching and spring around the corner, we’re about to start a season of get-togethers with family and friends who love nothing better than sitting around a table sharing food. 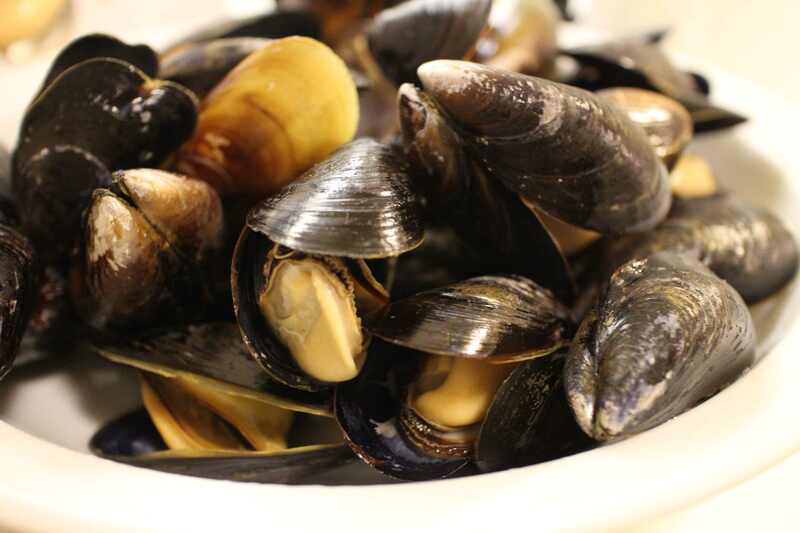 Most of these events will be informal, calling for finger food, whereas others will have us sharing a big messy dish such as fondue or bagna cauda or maybe now, a bowlful of mussels. This crowd likes classics that bring back memories but also appreciates surprises, something new to savor and discuss. 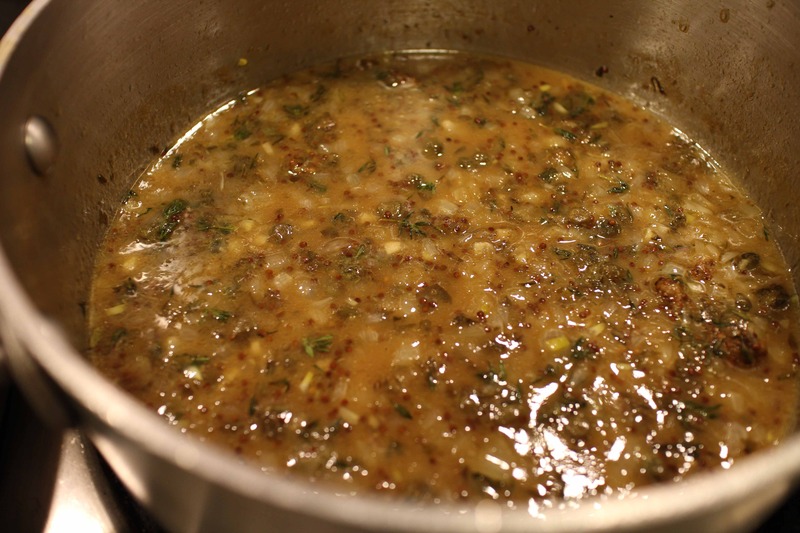 Since we’ve been cooking from Becky Selengut’s Good Fish all month, I dipped back in for ideas. And there were plenty. Though they were the most recent recipes I tried, Quinoa Cakes with Smoked Trout and Chive Sour Cream (page 157) and Smoked Trout Mousse with Radish and Cucumber Quick Pickle (153) will be immediate repeats for Easter weekend. Actually, the quinoa cakes – crispy and delicious – will become a permanent fixture in my repertoire since they offer lots of room for experimentation and can easily be made gluten-free. The same goes for radish pickle (I used gorgeous watermelon radishes that I’m definitely going to grow this year). 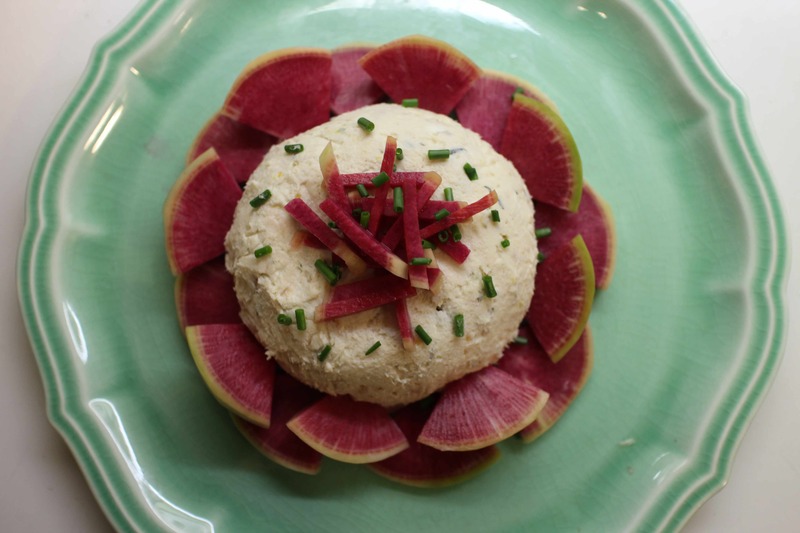 I used the radishes like crackers, smearing the trout mousse on top. Yum. My only regret was not smoking the trout myself. Time to dust off the outdoor grill. My rickety and poorly ventilated kitchen would not survive the stovetop version. The other two experiments were equally successful. 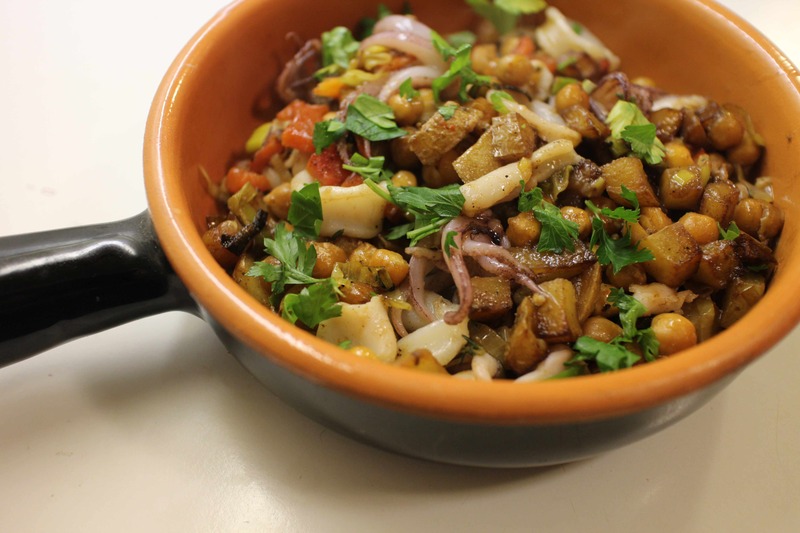 I liked the Squid with Chickpeas, Potatoes, and Piquillo Peppers (p. 214). I’ve been thinking about Spanish tapas and had a big pot of just-cooked chickpeas on hand. It made a tasty light supper served it in a terra cotta pan that pretends to be a cazuela. I can imagine serving it in tiny glazed terra cotta plates for a tasting menu. You know, the kind they sell to keep potted plants from leaking on your table. I already have a bunch of stickies marking recipes I want to try this season, and there will be so many more as the seasons change. Thanks again to Meg and Briggs for adding such a great resource to my library. You Seattle residents are so lucky to have Becky Selengut as a local treasure telling you about local fish, but I’m happy to know that she cut her teeth on fish right here in New Jersey (what exit was that again, Becky?). 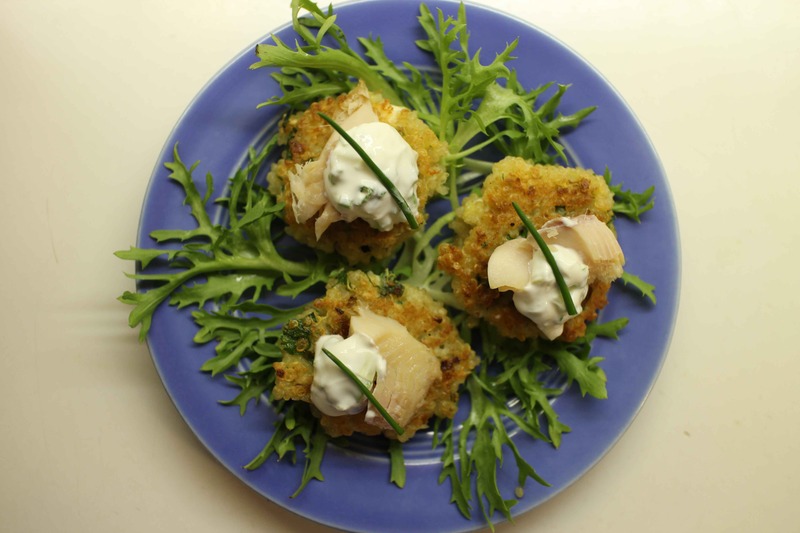 please, please post the recipe for Quinoa Cakes with Smoked Trout and Chive Sour Cream! I definitely will as soon as I have a chance. They’re fantastic. Well done Karen! Wow! You are fearless and great writing!